The History of the Detroit Lions, a professional American football franchise based in Detroit, Michigan, dates back to 1929 when they played in Portsmouth, Ohio as the Portsmouth Spartans. Currently in its 87th season, the Lions are one of the National Football League's oldest franchises. The Spartans' home field in 2008, now known as Spartan Municipal Stadium. The Spartans were initially formed in 1929 in Portsmouth, Ohio, drawing players from defunct independent professional and semi-pro teams in the Ohio-Kentucky-West Virginia tri-state area. They immediately made an impact by twice defeating the Ironton Tanks, a nearby independent professional team who had regularly played NFL member teams since the early 1920s with considerable success. Portsmouth residents agreed to fund the construction of Universal Stadium, a venue comparable to those in neighboring communities along the Ohio River, prompting the NFL to offer league membership in 1930. Portsmouth became the NFL's second smallest city, ahead of only Green Bay. During the team's first year in the league it compiled a record of 5–6–3 in league contests. Early highlights as the Portsmouth Spartans include the "iron man" game against Green Bay in 1932. In that game, Spartan coach Potsy Clark refused to make even a single substitution against the defending NFL champion Packers. Portsmouth won 19–0 and used only 11 players all game. At the end of the 1932 season, the Spartans were tied for first place in the league with the Chicago Bears. 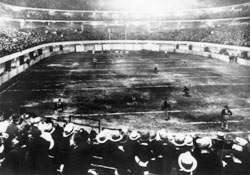 That prompted what in retrospect became known as the first NFL playoff game. Blizzard conditions in Chicago meant the game was moved from Wrigley Field indoors to Chicago Stadium, which allowed for only an 80-yard field. The game was won 9-0 by the Bears, on a touchdown pass from Bronko Nagurski to Red Grange. The resulting interest led to the establishment of Eastern and Western conferences and a regular championship game beginning in 1933. Despite great success on the field, poor revenues and the Great Depression threatened the Spartans' survival. In 1934, a group led by Detroit radio executive George Richards (owner of Detroit's powerful WJR) bought the financially struggling Spartans for $7,952.08 and moved them to Detroit and renamed the team the Detroit Lions, as a nod to the Detroit Tigers. He also said that the lion was the monarch of the jungle, and he intended for his team to be the monarch of the NFL. Through Richards' radio connections, the Lions were able to play a Thanksgiving Day game in their first season in Detroit, a tradition that continues to this day. Under quarterback Dutch Clark, Detroit won its first NFL championship in 1935, defeating the New York Giants 26-7. The 1940s were not a high point of the Lions history. They won a total of 35 games, for an average of 3.5 a season, including going 0–11 in 1942. The 1942 team's offense was so bad, it scored only 5 touchdowns all season and never scored more than 7 points in a single game. In the middle of the decade they had some success, finishing 6–3–1 in 1944 and 7–3 in 1945. The Lions were less successful in the latter half of the decade; from 1946 to 1949, the Lions won a total of 10 games. On November 7, 1943 the Lions and the New York Football Giants played to a 0–0 tie at Detroit – the last time an NFL game has ended with a scoreless tie. Detroit enjoyed its greatest success in the 1950s. Led by quarterback Bobby Layne, the Lions made it to the NFL Championship for the first time in 17 years in 1952 and defeated Paul Brown's Cleveland Browns by a score of 17-7 on December 28. The next season saw a rematch of the two teams, in which Layne found Jim Doran for a 33-yard game-winning touchdown in the closing moments to win 17-16. In 1954, the two teams would meet again, with the Browns getting the upper hand with a 56-10 victory. Three years later, in the 1957 Western Conference Championship Game, Tobin Rote, starting for an injured Layne, rallied the team back from a 27-7 halftime deficit to the San Francisco 49ers with 24 unanswered points to win 31–27. The next week, in the NFL Championship Game, Rote threw for four touchdowns and ran in another as the Lions routed Cleveland 59-14 and claimed their third championship in six years. In 1958, after he had led the Lions to three NFL championship games and provided Detroit nearly a decade of Hall of Fame play, the Lions traded Bobby Layne. Bobby was injured during the last championship season, and the Lions thought he was through and wanted to get what they could for him. According to legend, as he was leaving for Pittsburgh, Bobby said that Detroit "would not win for 50 years." Since this time, the Lions have not won another championship and have only a single playoff game win. The franchise's subsequent years of (mostly) futility has been labelled "The Curse of Bobby Layne." The Lions have only one playoff win since then, against the Dallas Cowboys in the 1991 season. Minority owner Ralph Wilson split off from the team in 1959 to take an American Football League franchise; initially planning to place it in Miami, he instead placed it in Buffalo, New York, where it would become the Buffalo Bills. For the first three years of its existence, the AFL's Bills and NFL's Lions had identical blue and silver colors, possibly second-hand from old Lions equipment. On January 7, 1961, the Lions defeated the Browns 17–16 in the first-ever Playoff Bowl matching the runners-up from the two conferences into which the NFL was divided at the time (the Lions also appeared in the game in both of the next two years pursuant to their having finished second to the Green Bay Packers in the Western Conference in all three seasons; the Playoff Bowl was abolished in 1970 when the merger of the NFL and AFL went into full effect). In the mid-1960s, the Lions served as the backdrop for the sports literature of George Plimpton, who spent time in the Lions training camp masquerading as a player. This was the basic material for his book Paper Lion, later made into a movie. On November 22, 1963 William Clay Ford, Sr. purchased a controlling interest in the team for $4.5 million. During Ford's ownership tenure which extended to his death in 2014, the Lions won just a single playoff game. Motown soul singer Marvin Gaye made plans, after the death of duet partner Tammi Terrell, to join the Lions and go into football. He gained weight and trained for his tryout in 1970, but was cut early on. He remained friends with a number of the players, particularly Mel Farr and Lem Barney, who appear as background vocalists on his 1971 classic single "What's Going On." With the 1970 NFL-AFL merger, the Lions were placed in the new NFC Central division with Minnesota, Green Bay, and Chicago. Finishing with a 10-4 record, they were the first team to qualify for the NFL's newly created wild card playoff position. However, they lost to the Cowboys 5-0 after a long, grinding defensive struggle and would not see the postseason again for the rest of the decade. While playing at home against Chicago on October 24, 1971 tragedy struck when wide receiver Chuck Hughes collapsed and died of a massive heart attack. He remains the only NFL player to ever die on the field. The team wore black armbands for the rest of the season, in which they finished 7-6-1. In 1972, the Lions improved to 8-5-1 and then dropped back to 6-7-1 the following year. Heart disease claimed another member of the franchise when head coach Don McCafferty died shortly before the 1974 training camp. That season saw the Lions finish at 7-7. On Thanksgiving Day, November 28, 1974, after over 35 years, the Lions played their final game in Tiger Stadium, where they lost to the Denver Broncos 31–27 in front of 51,157, amidst snow flurries and a 21-point Broncos 3rd quarter. The Lions moved to the newly constructed Silverdome and have played their home games indoors ever since (at Ford Field since 2002). Another 7-7 record was produced in 1975, the Lions' first year indoors and a 6-8 showing in 1976. The team finished 6-8 again in 1977, struggling the whole season with an anemic offense that only put up 183 points. More mediocrity followed in 1978 with seven wins in the newly expanded 16-game season. The bottom fell out of the Lions in 1979 with a 2-14 record. The Lions started the decade by drafting Billy Sims with the first overall draft pick in the 1980 draft. As a rookie that year Sims won the award for Offensive Rookie of the Year. Detroit finished tied for first place with the Minnesota Vikings in the NFC Central Division. Minnesota won the tiebreaker and Detroit did not make the playoffs that year. However, with Monte Clark, who had become the Lions head coach/GM in the 1978 season at the helm, and Billy Sims, the Lions made consecutive playoff appearances in 1982 & 1983 the first time since the 1953 & 1954 seasons. In 1982 during the strike-shortened season, their record of 4-5 was good enough to make the playoffs. However, they were quickly dispatched by the Washington Redskins by the score of 31-7. In 1983, the Lions won the NFC Central outright with a record of 9-7, one game ahead of Chicago, Green Bay and Minnesota, all tied for second place and also the last place Tampa Bay Buccaneers. On December 31, 1983, the Lions faced the San Francisco 49ers in a NFC Divisional Playoff game that came down to the wire. After taking a lead of 14-3 by the Joe Montana-led 49ers the Lions were able to trim the deficit to 14-9 by half-time on couple of field goals by Detroit's kicker, Eddie Murray, who made what was then a postseason record 54-yard kick in the closing seconds of the first half. On two touchdown- scoring drives, one capped by an 11-yard run and another by 3-yard run (both by Sims, who had 116 yards on 20 carries), Detroit took the lead for the first time of the day, 23–17, with 4:44 left in the game. Montana, who had been quite ineffective up to then, made one of his signature 4th quarter drives by completing 6 passes for 51 yards, the last one scoring the TD and gave the 49ers a 24-23 lead with 1:28 left. Detroit was not done, and even though Gary Danielson, who is fifth on Detroit's all-time passer list and was replacing injured current starting QB Eric Hipple, had a horrible game with 5 interceptions, he pieced together a closing drive to get the ball to the 49ers 26 yard line with 11 seconds left, where Murray who had previously made 3 of 4 field goals for the day missed for the second time from 43 yards on a kick that went just wide. In 1984, Billy Sims suffered a career ending injury that eventually cost Clark his job. The Lions brought in Darryl Rogers, considered to be an offensive guru who previously coached at the college level. However his tenure is marked with lots of disappointment. From 1985 to mid-season in 1988, he had acquired the record of 18-40 and was 2-9 in '88 before he was fired. He was replaced by (reply temporary) interim head coach Wayne Fontes, who by the end of his coaching career, would have the dubious distinction of having the most wins and losses of any head coach with the Lions. With the third overall draft pick in the 1989 draft, the Lions selected another running back, who would wear number 20, Barry Sanders. He played on offense with another rookie at quarterback, Rodney Peete. The Lions were much improved in 1989, but still finished a distant third with a 7-9 record. However, the winds of change were blowing in Detroit, because in 1989, Barry Sanders rushed for 1470 yards on 280 carries, and finished second in rushing just 10 yards behind the leader, which he had an opportunity to attempt to break by going back in late in the last game. However, with the Lions up by several scores, he took a pass, a trademark of his career. He earned the NFL's Offensive Rookie of the Year award. With such a young core, including the newest offensive picks, and with previous picks on defense, the Lions acquired eventual Pro-Bowlers Bennie Blades and Chris Spielman in 1988 along with Jerry Ball in 1987, things were once again looking up for the Lions. During his first season after being drafted in 1989, Barry Sanders missed the NFL rushing title by 10 yards because he chose not to go back into the game when the Lions already had the game won. According to Wayne Fontes, when he offered Sanders the chance to gain the yardage and the rushing title, Sanders declined, reportedly saying, "Coach, let's just win it (the game) and go home." Barry Sanders delivered an excellent performance in 1990, but the team only finished 6-10. Sanders won the first of his four NFL rushing titles that season with 1,304 yards, beating out Buffalo's Thurman Thomas by seven yards. In 1991, the Lions started the season by being shut out on national television, 45–0, by the Washington Redskins. The Lions then rebounded, winning their next five games. They went 12–4 for the season, and won their first division title in eight years, capping the regular season with a win over the then-defending, and soon to be repeating, AFC Champion Buffalo Bills. They were inspired late in the season by the loss of guard Mike Utley, who sustained a career-ending paralysis injury against the Los Angeles Rams on November 17, 1991. As Utley was carted off the field in that game, he flashed a "thumbs up" to his teammates and the Silverdome crowd. It became a rallying symbol for the remainder of the season. In the playoffs, the Lions dismembered the Cowboys 38-6 for the team's only postseason win since 1957. However, they were completely overpowered by the Redskins 41-10 in the NFC Championship. This was the first time a team that had been shut out in its opener had reached the conference title round. Two teams have since matched this feat: the Philadelphia Eagles and the New England Patriots did it in 2003. The Lions also made the playoffs in 1993, 1994, 1995, 1997 and 1999, making the 1990s one of the most successful decades in team history. In 1993, they went 10–6, first in the NFC Central Division, but lost to the Green Bay Packers. In 1994, they lost to the Packers in the playoffs again. In 1995, the Pittsburgh Steelers lost to the Packers in the final week of the season causing Detroit having to go onto the road to Philly. They lost to the Philadelphia Eagles and former Lion Rodney Peete, in an embarrassing fashion, 58–37 (entering the fourth quarter, they were down 51–7). In 1997, Detroit lost to the Tampa Bay Buccaneers in the first round. In 1999, the Lions closed out the decade reaching the playoffs for the sixth time in a ten-year span, which is a franchise record for playoff appearances during a decade. However, they lost yet again in the first round, this time to the Washington Redskins. Detroit's 1999 playoff berth also marked the second time in Bobby Ross's first three years as head coach that he led the Lions into the postseason. The last Lions head coach to accomplish that feat was Buddy Parker, in 1952–53 during his second and third seasons at the helm. In 1997, Barry Sanders ran for 2,053 rushing yards. At the time, his career total rushing 15,269 yards was second only to Walter Payton's 16,726 yards and he joined Jim Brown as the only players among the NFL's 50 all-time rushing leaders to average 5 yards a carry, but he retired abruptly after the 1998 season. Emmitt Smith has since broken Payton's record, accumulating 18,355 career rushing yards, which bumped down Sanders to the #3 spot on the list of total career rushing yards. After finishing the 2000–2001 season at 9–7, and missing the playoffs by a field goal in the season's last game, Lions owner William Clay Ford, Sr. hired Matt Millen, a former player and broadcaster, as president and CEO. The Lions went the entire 2001 (their last season at the Silverdome), 2002 (their first season at Ford Field), and 2003 seasons without a road victory, thus becoming the only team in NFL history not to win on the road for three consecutive seasons. The streak, encompassing 24 games (also an NFL record) came to an end on September 12, 2004, when the Lions defeated the Bears 20–16 at Soldier Field in Chicago. Over seven seasons under Millen's leadership as team president, the Detroit Lions owned the NFL's worst winning percentage (31–81, .277), never had a winning season, never finished higher than third place in the NFC North, and did not play in any post-season games. Millen received a five-year contract extension at the start of the 2005 season. In 2007, the Lions began the season with a promising 6–2 record. The optimism was short-lived, however, as the team recorded only a single victory in the next eight games, for a final record of 7–9. Although the Lions recorded a 4-0 record in the pre-season, they were winless during the regular season with a record of 0-16. They become the first team in NFL history to lose all 16 games in a single season and thereby they won the right to the first overall pick in the 2009 NFL Draft. On January 15, 2009, the Lions hired Jim Schwartz as head coach. Schwartz spent 10 seasons with the Tennessee Titans, eight of them as defensive coordinator, helping them compile a 13–3 record and first place in the AFC South in 2008. The Lions also hired a new offensive coordinator (Scott Linehan), and a new defensive coordinator (Gunther Cunningham). In April, they adopted a redesigned team logo, which was a more aggressive-looking version of the one that had been used since 1970. The Lions selected University of Georgia quarterback Matthew Stafford for the #1 overall pick in the 2009 NFL Draft. The six-year contract contained $41.7 million in guaranteed money (the most guaranteed to any player in NFL history, until Sam Bradford received $50 million in guaranteed money from the St. Louis Rams a year later.) and totals $72 million. In the first two games of 2009, the Lions lost to the eventual champion Saints and then to the Vikings. On September 27, 2009, the team broke their 19-game losing streak with a 19–14 win at Ford Field against the Washington Redskins. Losses resumed after that, which included handing the winless Rams their only victory of the season. Detroit's only other win of the season was against the Cleveland Browns, a surprise 38-37 thriller that saw Matthew Stafford throw the winning touchdown as time expired. The Lions then hosted Green Bay on their annual Thanksgiving game and lost 34-12. The remaining five games were lost, including a 48-3 annihilation in Baltimore and the team ended the year at 2-14. In the 2010 draft, the Lions used the #2 pick to acquire DT Ndamukong Suh from the University of Nebraska. They also drafted 2010's Mr. Irrelevant (the last player in the draft), Weber State WR Tim Toone. During a preseason match with the Browns, Suh (who had gained a reputation in college as an aggressive player) grabbed Cleveland QB Jake Delhomme by the facemask and threw him to the ground. Delhomme escaped unhurt, but Suh was fined $7,500 for the incident. The Lions began their 2010 season in Chicago, which in 2007 was the scene of their last divisional and last road win. Despite leading the Bears for most of the game, Detroit suffered a heartbreaking 19-14 loss when a touchdown pass to WR Calvin Johnson was ruled incomplete by the referees in an extremely controversial decision. Week 2 saw a close loss to the Eagles, a team Detroit had not beaten since 1986, and not at home since 1977. After this, they headed to Minnesota to take on the struggling Vikings, but were again denied a victory when Adrian Peterson pulled off an 80-yard TD run to win the game. Following this, the Lions came close to what would have been their first win in Green Bay since 1991, but in the 4th quarter Jim Schwartz decided to run the clock out instead of kicking a FG, allowing the Packers to drive downfield and get a TD. The Lions finally gained their first victory of the season when the Rams returned to Ford Field in Week 5 and were buried 44-6. Following a loss to the Giants, the Lions gained another easy win over the Redskins for their second straight victory over that team. Then came five losses in a row, including a Thanksgiving match with the Patriots where the Lions blew an early lead to lose 45-24. However, Week 14 brought a considerable turn of events when the Packers arrived in Detroit and Aaron Rodgers was taken out with a concussion in the 4th quarter. Matt Flynn failed to score any TDs, and the Lions won their first divisional match since 2005. After this, the team suddenly entered a late season hot streak, ending their road losses by beating the Buccaneers in Tampa Bay and hamstringing the latter's playoff chances. Another Florida victory followed when Detroit knocked off the hapless Dolphins in Week 16 and finally returned home to beat Minnesota 20-13 and end the 2010 season 6-10. Although Matt Stafford's plays had been few due to injuries, Drew Stanton and Shaun Hill performed credibly under center, and WR Calvin Johnson also played a key part in the team's six victories. Suh lived up to his fearsome college reputation too and proved himself to not be a bust as some predicted. Matt Stafford and Ndamukong Suh both underwent surgery in the offseason. Seeking to bolster their defense (ranked middle-tier in 2010), the Lions drafted DT Nick Fairley from Auburn with the #13 pick. The Lions opened 2011 with a rematch in Tampa Bay. Despite some offensive lag in the 3rd quarter, they pulled out 27-20. After the game, Jim Schwartz was nonetheless insistent that they still needed to fix a large number of mistakes on the field. Opening at home against Kansas City in Week 2, they torched their opponent 48-3 to set a franchise record for regular season points (beating the old record of 44 from 1995). The team continued to improve in Week 3 as they climbed back from a 20-point deficit to win 26-23 and beat the Vikings in Minnesota for the first time since 1997. This game marked the Lions' first 3-0 start since 1980. Detroit nearly lost it in Dallas the next week, falling behind 27-3 after one Matt Stafford interception. But a sudden Cowboys collapse allowed them to march back and win 34-30, moving to 4-0 and becoming (along with the Packers) one of two undefeated teams left. In Week 5, the Lions hosted Chicago for their first primetime appearance since 2005 and also the team's return to MNF after a decade-long absence. The capacity crowd (67,000; the largest to ever attend a Lions game at Ford Field) produced plenty of noise to disconcert the Bears' offense. A sloppy game with numerous penalties followed, but in the 2nd quarter Matt Stafford threw a 70-yard TD pass to Calvin Johnson. A TD run by Jahvid Best followed in the 3rd quarter, and Detroit maintained pressure the whole game on Bears QB Jay Cutler to win 24-13 and begin the season 5-0 for the first time since 1956. The Lions took their first loss after being beaten by San Francisco 25-19, but the game was more notable for Jim Schwartz getting into an altercation with 49ers coach Jim Harbaugh afterwards. After two days of deliberation, the NFL decided not to punish either coach for the scuffle. A second straight home loss followed as Detroit fell to Atlanta 23-16 after indifferent offensive performance. The following week, Detroit defeated Denver and QB Tim Tebow 45-10. The game included a 100-yard interception return for a touchdown by Chris Houston. But in Week 10, the Lions failed to carry out a season sweep of the Bears as their offense fell apart on a windy day in Soldier Field, losing 37-13. The team's wild ride through the 2011 season continued as they hosted the defending champion Packers on Thanksgiving, but the latter proved more than they could handle. Ndamukong Suh was ejected from the game after stomping on the arm of Evan Dietrich-Smith, a back-up guard assigned to block Suh, enhancing his reputation as a dirty player. This earned him a 3-game suspension as the Lions headed to New Orleans in Week 13. The game was flexed into SNF, and although they played well, discipline problems continued to mount as several costly penalties gave the Saints the win. Heading back home, the Lions next edged past a struggling Vikings team. With playoffs in sight, they went to Oakland in Week 15. At the end of a close game, Matt Stafford drove the team downfield and threw a TD pass to Calvin Johnson to tie the score. After the Raiders got the ball back, they attempted to kick a game-winning FG, but Suh blocked the attempt and the Lions headed home, beating San Diego to complete their sweep of the AFC West and securing a wild card along with the franchise's first playoff appearance in 12 years. With only seeding still in question, they went to Green Bay to take on the Packers' backup players. Victory proved elusive again as Matt Flynn threw 6 TD passes on the Lions to win. With Detroit relegated to the #6 playoff seed, they lost a rematch with the Saints in New Orleans during the wild card round. Highlights of the season included Matt Stafford overcoming the injury problems he'd been plagued by in 2009–10, as well as the emergence of Calvin Johnson as one of the league's elite WRs. The 2012 season saw the Lions try to improve over their impressive 2011 season. They started 4–4, then lost their last 8 games, their longest streak since 2008, to finish 4–12. This was the last season for PK Jason Hanson, the oldest then-active player in the NFL at 42 years old, who retired after the season ended. The 2013 season saw the team improve. By week 10, following their first win at Chicago since 2007, the team was in first place in the NFC North. In week 13, the team won their first Thanksgiving game since 2004 in a 40–10 whipping of Green Bay. However, the Lions had lost their previous 2 going into the game, and would lose their last 4, including a heartbreaking 23–20 OT loss in their last home game of the season to the NY Giants, who had nothing left to play for. The Lions were thus eliminated from playoff contention, and followed that by losing their last game to Minnesota in the last game ever played at the Metrodome. Overall, the Lions finished 7-9, 3rd in their division, resulting in the firing of coach Jim Schwartz on December 30. On January 14, 2014 the Lions hired Jim Caldwell as their new head coach. He is the first African American head coach in the franchise's history. On March 9, 2014, long-time owner William Clay Ford, Sr. died at the age of 88. On March 10 it was announced that controlling interest in the Detroit Lions would pass to Ford's widow, Martha (née Firestone) Ford. During the 2014 season, the influence of Jim Caldwell improved the Lions drastically from the previous two seasons. Touting the league's second-best defensive unit (behind only the reigning champion Seahawks), the Lions posted an 11–5 record and qualified for the playoffs. However, the Lions suffered a controversial loss to the Dallas Cowboys in the wildcard round of the playoffs. On November 5, 2015, the Lions fired general manager Martin Mayhew and president Tom Lewand, following an 1–7 start to the season. During his tenure as general manager, the Lions were 41–63, and made the playoffs twice, and lost both times in the Wild Card round. On November 19, the Lions hired Rod Wood as team president. On January 8, 2016, the Lions hired Bob Quinn as general manager. Lions release Joique Bell and Stephen Tulloch. ↑ Mayer, Larry (March 1, 2014). "Bears played NFL's first indoor game". Chicago Bears. Retrieved March 1, 2014. ↑ Willis, 2010, p. 323–325. ↑ Peterson, 1997, p. 122. ↑ McDonough, 1994, p. 50. ↑ Battista, Judy (March 9, 2014). "Automaker William Clay Ford Sr. couldn't make Lions hum". NFL.com. Archived from the original on March 16, 2014. Retrieved May 9, 2014. ↑ "A gentle soul off the field, Barry Sanders runs up a storm for Detroit". CNN. Retrieved May 1, 2010. ↑ Seifert, Kevin (January 22, 2013). "Big Decision: Quarterback contracts". ESPN. Retrieved January 23, 2013. ↑ Reid, Jason (2009-09-27). "Redskins Allow Lions to End 19-Game Losing Streak". Washington Post. Retrieved 2009-09-27. ↑ Patra, Kevin (January 14, 2014). "Jim Caldwell hired by Detroit Lions as next coach". Detroit Lions. Retrieved January 14, 2014. ↑ Twentyman, Tim (March 10, 2014). "Martha Ford takes over Lions ownership". Detroit Lions. Retrieved March 10, 2014. ↑ "Martha Firestone Ford names Rod Wood team president". Detroit Lions. November 19, 2015. Retrieved November 19, 2015. Grene, Bob. "What if the NFL had stayed in town?" CNN. February 6, 2011.